Time To Think About Supply Chain Shortages? Despite their pivotal role in the high technology supply chain, electronic components are essentially a cyclical industry akin to older markets like steel and housing. As with steel and home building, growth expansion requires significant skills and capital expenditures, thus additions and reductions tend to be uneven and disruptive. And, like those industries, the willingness to get caught up in trend extrapolation has a powerful allure. Every participant in the supply chain gets caught up in the frenzy, thus the acceleration to the top and the inevitability of the cycle. For example, when memory prices were skyrocketing in the mid 90’s, major suppliers like Micron Technologies and Samsung all set out on massive capacity expansion programs adding capacity in a never before seen pace. The result? Two years after the capacity was in place, memory prices had plummeted as supply far outstripped demand. In another example, at the end of the 90’s, capacitor manufacturers who had for many years been pruning capacity, found themselves in a highly capacity constrained market. Manufacturers like Kemet and Vishay could not keep up with the demand. As a result, the relatively cheap but ubiquitous capacitor skyrocketed in price. Buyers hoarded and bid up prices in an effort to keep their factories from being shut down. Less than a year after capacity expansions and manufacturing productivity improvements, the prices had been dashed back to the floor. Yet electronics differs from other cyclicals in important ways. Electronics is a highly transparent industry with significantly greater concentration and flow of information. Senior executives at electronics companies tend to be more market sensitive and biased toward rapid action than in older industries. So, despite a historic inability to recognize exuberance and respond accordingly, management tends to act rapidly to remedy a situation once the case has been proven. Capacity additions or plant closure decisions are taken, businesses sold, or exited – all of which occur at break neck speed. The result is that electronics component cycles are shorter and more pronounced both on the upside and downside than those in many other industries. So for electronics manufacturers, the challenge is in plotting where we are in the cycle, and then determining how the engineering and procurement organizations should be focused to manage through the abrupt changes in trends. Paradoxically, though electronics manufacturing depends heavily on the availability and pricing of electronic components – both semiconductors and PEMCO (passives, electro-mechanical and connector) devices – few of these companies actually take a strategic lens to their supply market. Even fewer focus on understanding the dynamics of supply and demand and the potential impact on the most significant portion of product cost. And to compound matters, consider the additional complications added to securing supply in a supply chain that has undergone significant changes with the additions of EMS, and franchised and independent distributors. When plotted against a strategic grid, it is immediately apparent that technology commodities have significantly different value and requirements to electronic manufacturing organizations. And because of the dynamic nature of the industry and the shifting balances between supply and demand at the commodity technology level, the strategic grid needs to be updated and reviewed frequently. When LCD panels were being used in expensive “flashy” stand-alone monitors for display on managers’ desks, the issues with manufacturing yield and resultant capacity were not significant worries to the procurement organization. However, as the technology became more pervasive as flat panel television sets, and with notebook computers using LCDs continuing to increase in share, the supply chain demand imbalance became acute. The technology had shifted, from being a bottleneck item (constrained technology), to becoming mission critical. Apple computer, despite their small share of the computer marketplace had foreseen this shift and planned for it by creating a partnership with Samsung, a major LCD player. Consequently, Apple was able to pursue its strategy of shifting away from CRTs towards LCDs despite critical supply shortfalls in the industry. Several years ago, Intel raised its prices on flash memory. It saw a potential mismatch between supply and demand, and shifted its pricing strategy as a supplier to maximize its profit picture. Competitors scooped up the lost sales and Intel was castigated by financial analysts for the move. It was only a short time later that the move made sense. Though they had moved early, the imbalance between supply and demand that Intel was betting on was borne out. This is just one example of a technology that migrated to a supply-demand imbalance in the face of a wide spread depressed electronics components market. Electronics components were in abundant supply in 2009, and in many categories this is still the case today. But those companies that assume this will continue for a long time, and manage their procurement strategies and supply chain as static-state exercises, will no doubt find themselves short or paying a lot more for parts in the next up-turn. The only question is when will that occur. We know that Intel and Apple are good at placing their bet. Others must be compelled to do the same, for the risk of inaction could prove to be crippling. Engineering and procurement organizations should be seriously reviewing their portfolio of technology commodities and devising and implementing strategies to ensure that in the near future they will be assured cost-effective supplies. To do so means pursuing one of two paths for mission critical supplies. Either design around multiple sources to minimize supplier risk, or drive designs around fewer suppliers (driving up leverage) and seek supply partnerships to minimize supply risk. Both paths have implications far beyond procurement. They affect product design and decisions to outsource. They impact the degree of dependence on distributors, direct procurement, or requiring that EMS provide components through their own procurement. For example, moving to multiple suppliers will drive down the value of sourcing directly and lessen the leverage one has with an individual supplier. One might be better off pursuing a strategy involving a distributor with the desired lines. That distributor would be much more willing to set aside short product for you when the time comes. Either way, now is the time for such scenario planning to occur. Stop behaving as if you are sitting at a roulette wheel, with your supply chain strategy. 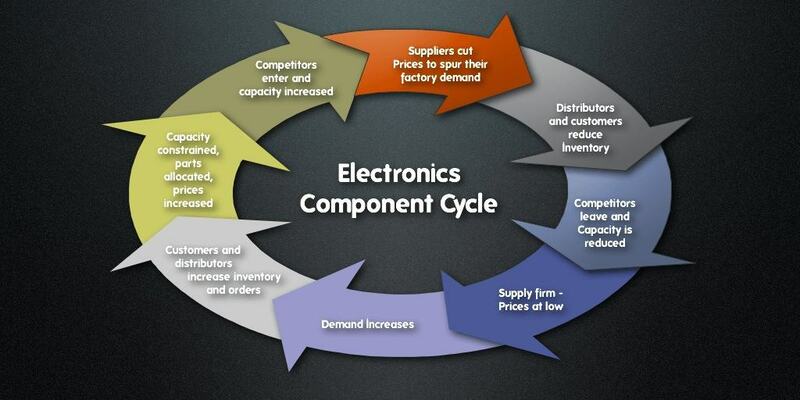 Today, when it seems that component prices are likely to stay in the doldrums, is precisely the moment when electronics procurement organizations should be focusing on ensuring the availability of strategic supplies. Fortunately, this focus does not require giving up anything in the short-term. Organizations that focus appropriately also find significant short-term opportunities for supply cost reductions. Do it now, for before you know it, the next up cycle will be upon us and who knows how much you will have to pay to ensure supply, or how much your output will be constrained by shortages. Supply chain is very important for a business. We should always keep our focus with this area. It can make or break a company. We manage the long distance component of the supply chain for companies who’s transport requirements are incidental but important for the success of their business. We pride ourselves on each customer partnership and provide tailor-made logistical solutions and freight management service. In current studies, resilience, as “the skill of a supply chain to manage with modify”, Supply chain security has become mainly significant in current years. As a effect, supply chains are often subject to worldwide and restricted regulations. I agree, supply chain management has to be at the forefront of business planning. It’s amazing to think with all the experts and technology we have within the supply chain industry that companies still seem to ignore it. Relatively speaking, the supply chain is a vital part of business. Focusing on the supply chain can really make or break a company. If you are a manufacturing business you really need to keep the supply chain in mind. Previous Post:What Happened To Customer Service?Next Post:Enlightened Service - Keeping A Customer For Life!